Summer holidays are nearly over for a lot of people and now all I keep hearing (and seeing on Instagram, Facebook, etc) is people talking about kids going back to school, the end of the long nights and the warm weather. Well, here in Spain is still pretty damn hot and let me tell you something: there are exactly 28 days until the end of summer so I refuse to believe that popsicles, ice creams, cold drinks and other refreshing things are officially gone, hell no! I'm one of those persons that crave for ice cream even on the coldest winter day and runs to the supermarket to buy a big tub of ice cream (and the cashier girl gives me a weird look and tells me 'you will catch a cold!'). 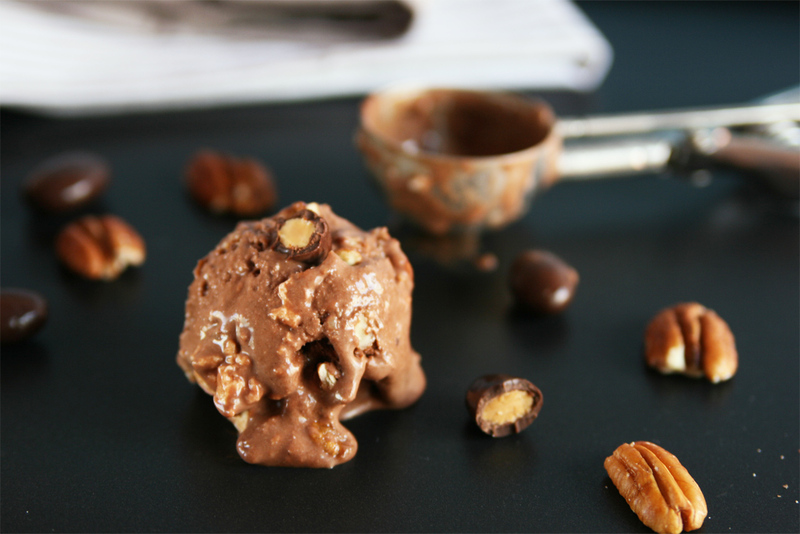 I made this vegan version of the classic Rocky Road ice cream flavor for the very first time last week and it certainly won't be the last because it is so amazingly creamy and has three yummy chunks: marshmallows, dark chocolate covered almonds and pecan nuts. I mean, one scoop of this ice cream will make you cry tears of joy...and then you'll want a second and a third scoop. This is pure decadence, it's the best chocolate ice cream I've done so far. 4 cups full fat coconut milk. 1 cup fine whole cane sugar. 2/3 cup pure cocoa powder. 2 to 3 tsp pure vanilla extract. Marshmallows, cut in small chunks. Dark chocolate covered almonds, cut in halves. 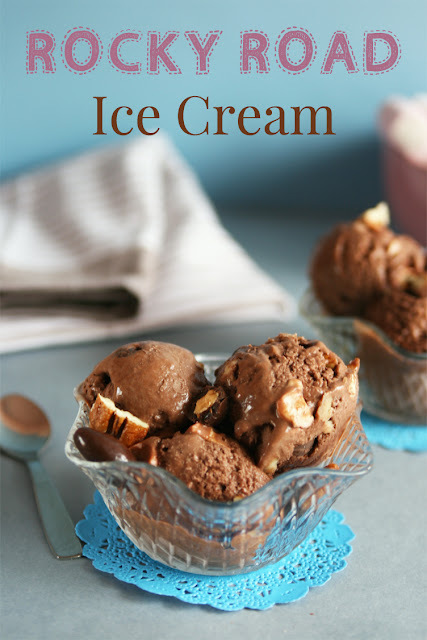 - When making vegan ice cream I always get the best results when I use canned full fat coconut milk that already has a thickening agent like guar gum. Then I add a bit of xanthan gum and the ice cream becomes super creamy, easy to scoop and has zero ice crystals. 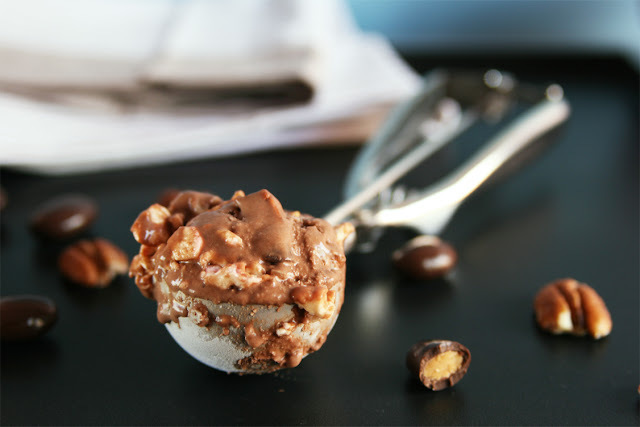 - Add about 1/4 cup for each add-in approximately or change the amount of chunks to fit your taste. - You can also try combining different nuts or replace the pecan nuts for walnuts or even pistachios (chocolate + pistachio is such a great combo). - For those who follow a strict vegan diet: read carefully the labels when buying marshmallows and make sure they are vegan. At least 24 hours before you plan to churn the ice cream, put the ice cream maker's bowl in the freezer. In the jar of your blender pour the coconut milk and sugars and blend on high speed until the sugars are well incorporated into the milk. Add in the pure cocoa powder and vanilla extract and process again until thoroughly incorporated. Carefully add in the xanthan gum, stir with a few slow movements with a silicone spatula to make sure the gum won't stick to the sides of the jar. Blend on low speed for a few seconds and then increase the speed to high and blend for 1 to 2 minutes. At this point I recommend to chill the base of the ice cream for a couple hours (around 3 hours depending on the temperature of your refrigerator). A chilled base will give you a good creamy ice cream later. Right before churning whisk the ice cream base just in case there are a few lumps. Pour it into your ice cream maker and churn following the manufacturer's instructions. I always churn my ice cream for 30 minutes. 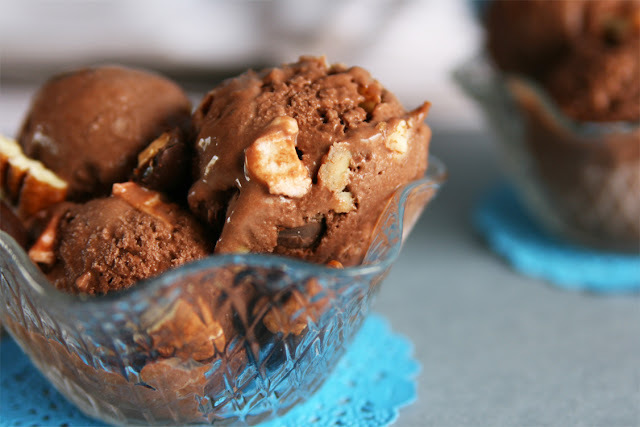 During churning the ice cream should increase in volume and look more creamy and fluffy. It doesn't need to double its volume or look like super fluffy cream, so don't panic as long as the ice cream looks dense. 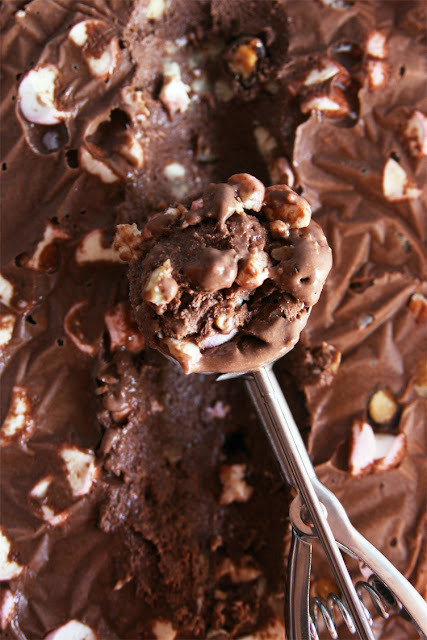 Add the marshmallows and nuts in the last minute of churning. Transfer the ice cream to a shallow, flat airtight container. 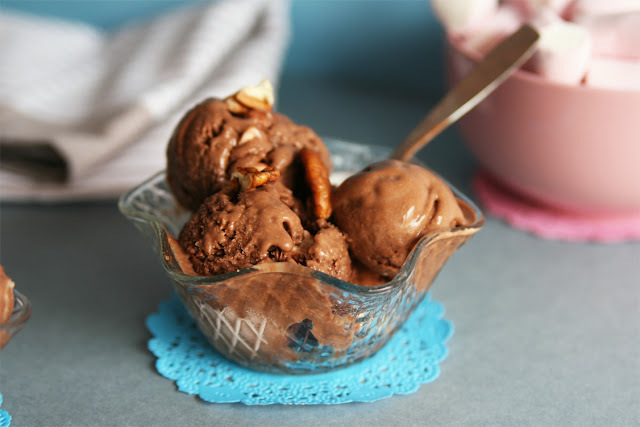 Place a layer of plastic wrap between the ice cream and the lid, pressing the plastic wrap firmly against the entire surface of the ice cream to prevent ice crystal from forming. Freeze for at least 4 hours until the ice cream hardens. If the ice cream is too hard to scoop let it soften for around 30 minutes in the refrigerator before serving. 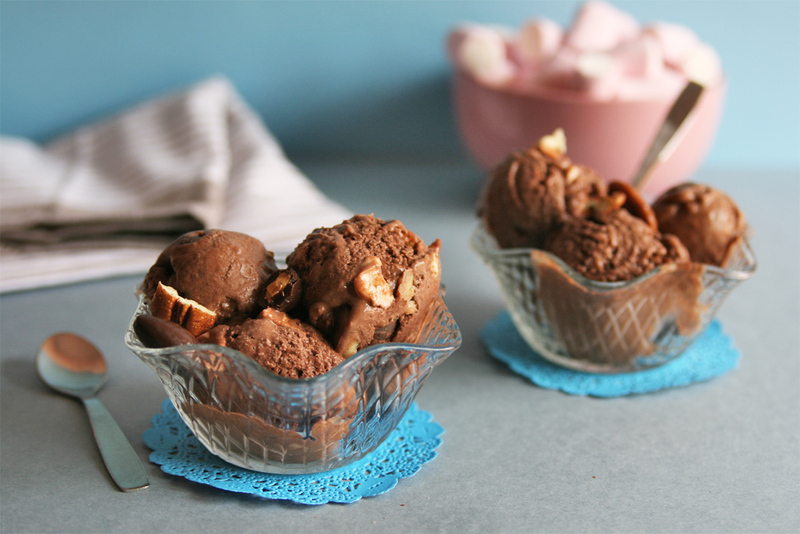 One trick: chill the serving bowls/cups to help keep the scoops firm for longer so your ice cream doesn't melt too quickly and you can enjoy it from the beginning to the very end.